FATTO GATTO RACING CURRENTLY HAS THREE SHADOW FORMULA 1 CARS. Acquired in 1999 from Don Nichols of Salinas, California, as a restoration project. Chassis number was assigned DN9-1/B (R) as a re-creation as it was based on a tub of unknown history. 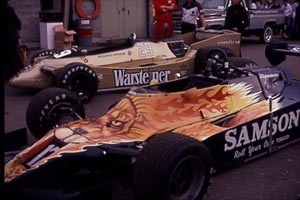 It was liveried in the colors of Jan Lammers, sporting the Samson Shag​ Lion logo (earlier version), as raced in Argentina and Brazil in 1979. The bodywork still carried the tech stickers from Argentina. A DFV engine was purcashed from John Nicholson in the U.K. Restoration work was carried out by Brian Stewart of Indianapolis, Indiana. The first outing was at Mt. Tremblant, Canada, in 2002. 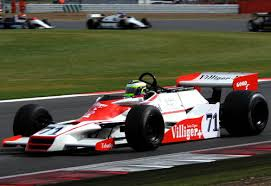 The car has been actively raced since then with the Historic Grand Prix Group, and then the Masters Historic Racing Group. The original painted Samson Shag Lion bodywork was purcashed in 2010 and the livery was changed to the newer version. The car is maintained by Paradise Restorations of Sonoma, California. The car is based at Sears Point Raceway. All of the Shadow Cars spares for the DN-9 series cars were purcashed from Don NIchols, Salinas, California, in 2016. Included in this lot was an original tub, bare except for the forward roll hoop. It carries a hand-written indication that it was the spare tub in Germany of 1979. 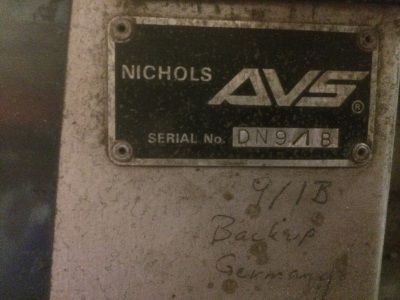 It also has an original AVS chassis tag of DN9-1/B. These facts agree with the information presented on oldracingcars.com website. "German Grand Prix Hockenheim - 29 Jul 1979 Shadow DN9 [1B] - Cosworth DFV V8 Jan Lammers (Spare - not used in practice)"
The plan is to restore this chassis over the next few years as time, parts, and money allow. 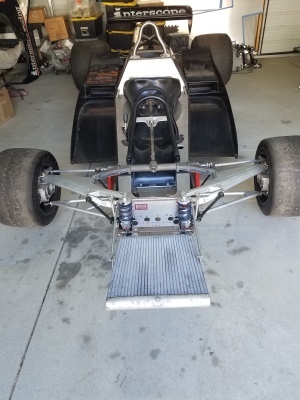 Acquired last year from a long-standing business associate of Don NIchols, Chassis DN9-2/A is based on a rebuilt tub that was originally thought to be destroyed at Silverstone in March of 1978, in an accident between Mario Andretti and Clay Regazzoni. However, the tub remained in Don Nichols' possession and was rebuilt by Marc Bahner in 2002. It was originally liveried as the Villager car but has had the livery changed to the Ongais Interscope bodywork (originally on DN9-3/A - location unknown, possibly converted to a DN9-B car). This car is undergoing restoration at Paradise Restorations at Sears Point Raceway, California. 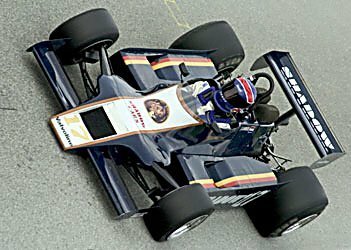 It will be presented in the Villager livery as run by Hans Stuck in 1978.